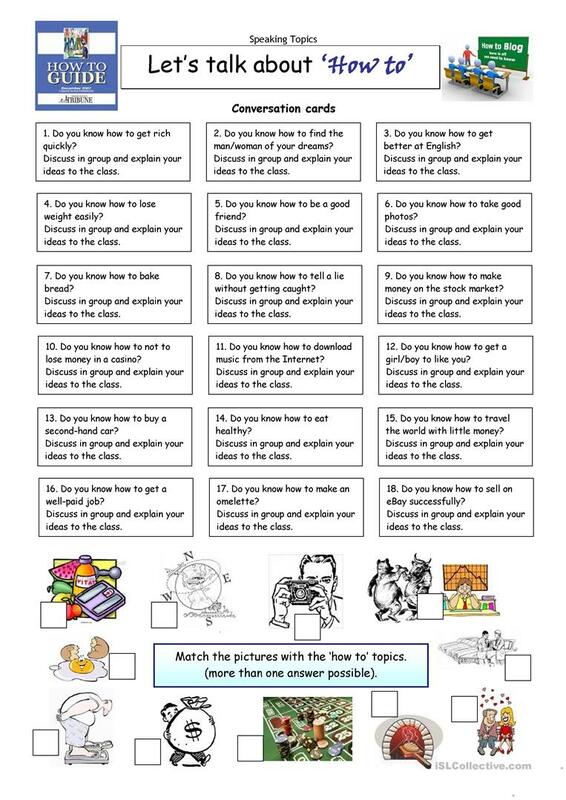 This worksheet contains 18 conversation cards and a matching exercise with pictures. The cards can be cut out if desired and be used as conversation questions. Can be used with both teens and adults. ATTENTION: This speaking worksheet is slightly different from all the others as it can be used easily with large classes for group work. Just divide the class into small groups and give one topic card to each. They can discuss or research the topic together and later present their solution (the How To do something) to the whole class. You can give each group a different card or - if you want to compare - the same one. The above printable, downloadable handout is best suited for business/professional students, high school students and adults at Pre-intermediate (A2), Intermediate (B1), Upper-intermediate (B2), Advanced (C1) and Proficient (C2) level. It is useful for improving your pupils' Listening, Speaking and Reading skills. The solutions are provided, too.